Imagine lavish multicourse dinners served on the beach, cocktail parties with celebrity chefs you’ve seen on TV or wine tastings led by award-winning sommeliers. These are just a few reasons why tourists are flocking to food and wine festivals being held at resort destinations across Mexico and the Caribbean. These festivals celebrate regional foods, wines and spirits, simultaneously offering guests a taste of local culture and opportunities to mix with locals as well as other visitors who share their passions for gastronomy. Often held during low-occupancy or shoulder seasons, festivals help promote destinations as well as individual resorts, restaurants and food producers. In addition to their economic benefits and support of aspiring chefs, many provide assistance to charitable and community organizations. This two-week festival of the “big crush” began Aug. 1, celebrating the wine harvest. Participants can partake in more than 40 events across the region, including vineyard tours, exclusive dinners and galas, and live entertainment ranging from jazz to opera. This is one to consider for next year because the kickoff was a sellout. It is held at the Riviera del Pacifico in Ensenada, once an iconic hotel for the Hollywood elite in the 1930s. Though Mexico is famous for tequila and beer, this region produces 90 percent of the country’s wines, which are garnering increased attention from wine enthusiasts. More than 50 wineries participate. This weeklong festival highlights regional cuisine and wines of Baja California. Taking advantage of the temperate climate, most events are held outdoors. For example, the main event (typically drawing as many as 2,000 people) is held in a sculpture garden at Puerto Los Cabos, with more than 50 restaurants and 16 wineries participating. Sponsored by CANIRAC, a Mexican restaurant trade group, and the Los Cabos Tourism Board, proceeds from the main event are donated to the fire department, Red Cross and Children’s Foundation of Los Cabos. Among the chefs confirmed to attend: Federico Zanellato (formerly at the legendary NOMA restaurant in Denmark) and chef/restaurateur Richard Sandoval. Now in its fourth year, this festival celebrates cuisine from Europe and the Americas, featuring top chefs and sommeliers. Festivalgoers participate in wine and spirit (including mezcal) tastings; a gourmet tasting village featuring local products and signature dishes; a Taste the New World opening dinner; interactive cooking challenges with chefs; and a lecture-style culinary education series. Next year’s honorees are not yet named, but this year’s tribute dinner held at Secrets The Vine honored French chef Daniel Boulud and Mexican chef Guillermo Gonzalez Beristain. 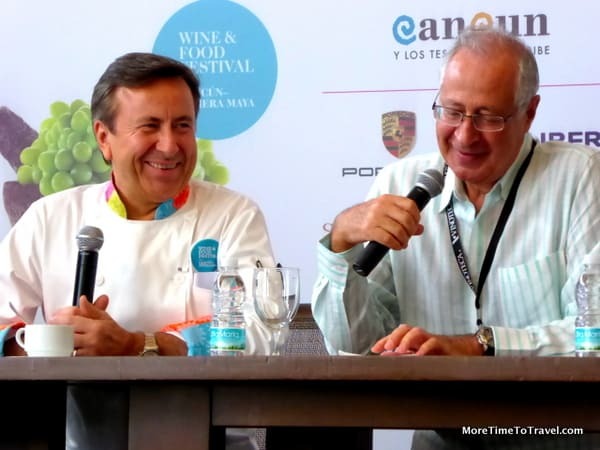 Founded by David Amar, who hoped to raise the gastronomic profile of the region, the festival has attracted broad sponsorship from Food & Wine Magazine, Travel + Leisure magazine, the Cancun Convention & Visitors Bureau, the Riviera Maya Tourist Promotion Trust and the Mexico Tourism Board. A portion of funds is used to provide computers for a nonprofit housing program, for educational and social services for needy children and families, and to award scholarships to gastronomy students. This festival is intimate (limited to 120 participants) and immersive. Held at a spectacular five-star beach resort located a Land’s End (where the Pacific Ocean meets the Sea of Cortez), this four-day epicurean adventure features gourmet Baja and international cuisine and offers opportunities to interact with chefs, winemakers and mixologists. The resort’s food and wine director and executive chef both once worked under legendary chef Thomas Keller. Festivities include a welcome reception showcasing artisanal Mexican cheeses, wines and specialty dishes; a tequila seminar and wine tastings; a beach barbecue; and a five-course dinner with each course prepared by a different chef. Celebrating Caribbean culture and cuisine, this event is sponsored by local hotels and restaurants in partnership with the Turks and Caicos Tourist Board. All-star chefs from around the world (such as “Top Chef” contestant Leah Cohen of New York’s Pig & Khao) and renowned vintners take part. Now in its fourth year, it raises funds for the Department of Youth Affairs and the islands’ Little Chefs mentor program that supports and encourages local chefs to pursue careers in hospitality, an industry vital to the local economy. The welcome dinner, limited to 100 guests, takes place at Blue Haven Resort and Marina. Also on the menu: a Women of Wine luncheon at Beach House Turks and Caicos; four food and wine pairings (limited to 20 people each) at West Bay Club; an Island Street Food Fair demonstrating expert grilling and barbecue techniques; Dinner with the Stars at Grace Bay Club, which is a lavish five-course food and wine pairing held on the beach; and The Gourmet Safari, a progressive dinner party that allows visitors to dine at different resorts and discover talented local chefs. This six-day festival on the largest of the U.S. Virgin Islands began more than a decade ago when two local restaurateurs wanted to bring the restaurant community together. The kickoff event, Cuisine on the Green, is held at Carambola Golf Club, where small bites and spirits can be sampled at every tee. Other activities held across the island include food and wine tastings, specialty dinners, celebrity chef competitions, cooking demos, a city crawl, a food fight on the beach, gourmet dinners and a sunset barbecue. With kids’ cooking classes, this one is fit for the whole family. The festival benefits the St. Croix Foundation, which aims to improve educational conditions in the country. Guest chefs (such as Tony Castellucci, executive chef of the Facebook Culinary Team) teach a class at a local high school and offer culinary internships. Great rundown of fun festivals. Really, something for every wine connoisseur!! These festivals look enticing! Another reason to visit sand-and-sea destinations :-). Some great choices here Irene! I can certainly vouch for the Cancun-Riviera Maya Wine & Food Festival…it was an amazing opportunity to meet world renowned chefs and sample incredible food in a exotic location. How much better can it get than that? I haven’t been to all of them here but can second the motion about the Cancun-Rivera Maya Wine & Food Festival! Seeing how I am in Mexico right now, I’ll have to check out at least one of these events soon … thanks for listing these events! Hope the timing coincides so you can get to one!